What, like washing dishes is hard? 1. Make one-pot meals in a non-stick skillet to minimize the amount of dishes you need to use (and thus need to wash). This pan is 10" and is oven safe up to 400 degrees. 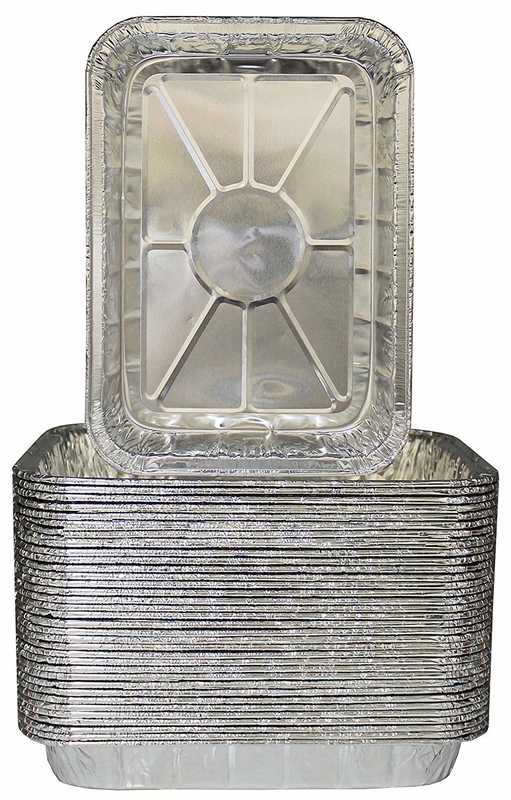 It is made of aluminum, comes with a lid, and has a silicone handle. It has a thermo-spot indicator, which means the circle in the middle will turn solid red when it is perfectly heated for cooking. Here's a bunch of one-pot recipes for inspiration. Another good tip is to read a recipe beforehand to see how many dishes you will need. You may even be able to turn that multi-pot meal into a one-pot meal by planning and thinking ahead. Get it from Amazon for $22.47. Psst! If you prefer a cast iron pan, you can get this highly-rated, pre-seasoned skillet from Amazon for $14.88+. Dutch ovens are also great for one pot meals — you can get one from Amazon for $54.95. And be sure to check out BuzzFeed Reviews for an in-depth comparison of the best Dutch ovens at three price points if you want even more options. 2. Wash your dishes with silicone scrubbing gloves to not only protect your hands, but to give you maximum scrubbing power. 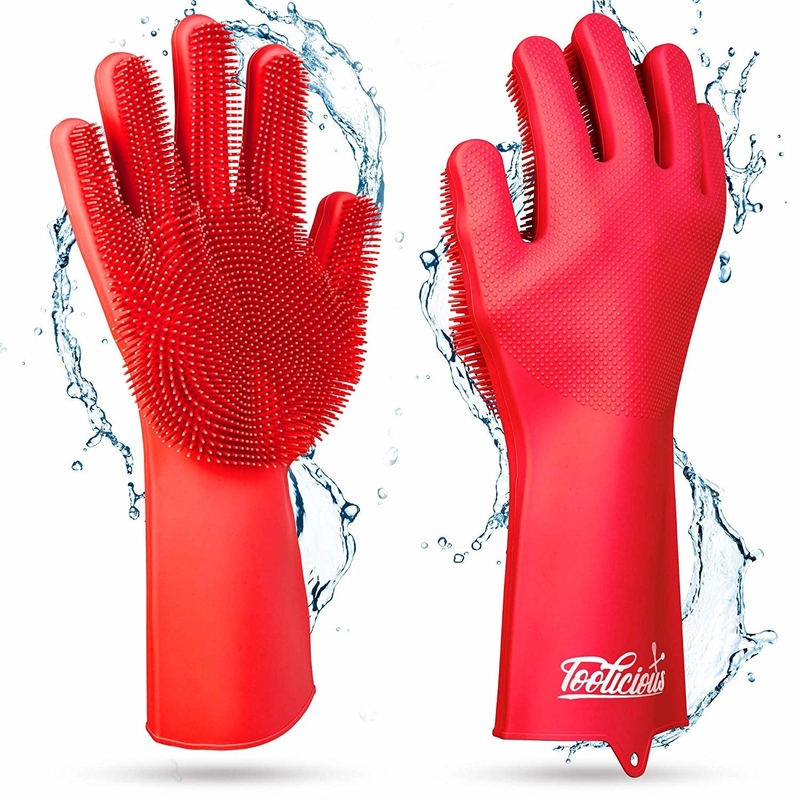 These waterproof gloves are made from stretchy food-grade, anti-odor, and anti-bacterial-forming silicone. 3. Clean as you cook so you're not left with a million dishes at the end of your meal prep sesh. As you're cooking, put things you are done using in the sink so they are all in one place, ready to wash, and not hanging out all over the kitchen (you can also set up a bin for them to soak in, if you prefer) — this lets you avoid scrubbing dried, caked-on food later. And keep your garbage accessible so you can toss food scraps and scrape dishes as you go. For recipes that don't require your attention at all times (like soup or baked ziti) clean all your prep tools as the food cooks. Then you can eat worry-free and only have one last pot/pan to clean. 4. Get a microfiber washable sponge to avoid constantly replacing your smelly sponges, which can become costly! Instead, use this one for a few weeks and then throw it in the washing machine. It will be good as new. Get a four pack from Amazon for $12.52. 5. Clean your water bottles or travel mugs using an all-natural cleaning tablet. We all know washing those things can be a pain, but these tablets make it too easy! 6. Scrub hard-to-clean utensils with a blade brush. This makes it safe and easy to clean sharp blades and pointy forks. 7. Make sure to scrape the food off your dishes with a dish squeegee before washing them. This will make your dishes easier to clean. It also saves your one and only sponge from any nasty food stains (which contribute to bacterial growth on the sponge). Promising review: "I keep this with my sponge, at the ready. It works much better and faster than using a spoon or other utensil to scrape off dishes. I'm glad I got it." —Susan S.
8. 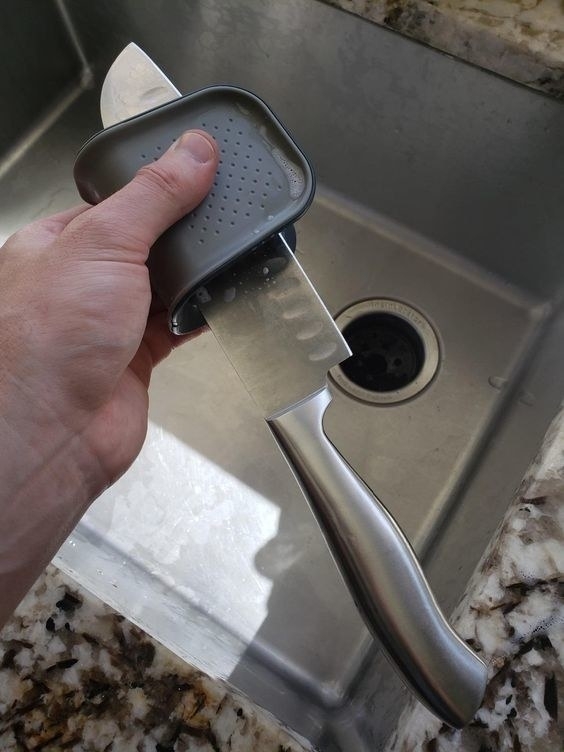 Use a food scraper to scrape away stubborn food remains when your roommate accidentally leaves their peanut butter plate in the sink for three days. Get a three pack from Amazon for $7.59. 9. Turn the cold water on to clean dairy and starches off of your dishes. This prevents the food remains from getting gummy and makes it easier to rinse away. 10. Keep your dirty dishes in a collapsible bin to free up the sink. You can also use it to soak those dishes that just really need to sit overnight. Bonus points: That collapsible factor means it's super easy to store! Plus if you have roommates, and enough free counter space, you can each have your own dish bin to keep the sink free and know whose dishes are whose! 11. Hang a wire shelf over your sink so you can dry your dishes and save counter-space. No more bulky dish-drying racks. Learn more about this hack on From Oh, The Projects You'll Do. This hack picture shows the shelf over the sink so the excess water can drip into the sink, but you can also put a dish drying mat on the shelf so the dishes still dry, but don't drip! This will also allow you to hang the shelf anywhere in your kitchen, if over the sink isn't your preferred placement! Promising review: "I mounted this shelf over the kitchen sink in my RV, which added much needed counter-space. For example, I lay out the dish drying mat on it and put the washed dishes on it to dry. Now I don't have to use the stove top for counter space. It's only 12 inches deep, so it doesn't stick out and is not in the way at all. This is a perfect trick for small spaces." —Sandi S.
Get a similar product from Amazon for $12.99. 12. Or leave the dishes to dry on a roll-up drying rack if you don't want to install a piece of wire shelving, but still want to save counter space in your kitchen. Get it from Amazon for $11.98+ (available in four sizes). 13. Soak a dryer sheet in warm water and dish soap to make it easier to swipe away the grime from a dirty pan. Check out Nifty's full tutorial. 1. Fill pan with warm water and a dash of dish soap. 2. Add a dryer sheet. Let soak for about an hour. 3. Rinse, then wipe down with a sponge. The burnt-on food, grease, etc. should be softened and wipe right off! Get dish soap for $5.05 and dryer sheets for $5.70, both from Amazon. 14. Keep your hands and dishes spick-and-span by getting down and dirty with a natural dish soap. This soap is sulfate-free (SLS, SLES, SCS), triclosan-free, paraben-free, petrochemical-free, and does not use animal by-products, toxins, perfumes, or ingredients that dry out and damage your skin. It is also non-toxic, hypoallergenic, vegan, gluten-free, biodegradable, and NEVER tested on animals. It has a light green tea and lime fragrance, keeps your hands soft, and still destroys grease from the greasiest of pans! Get it from Amazon for $7.15. 15. Waste less soap by pouring it into a touch-less foaming soap dispenser. This will help control the amount of soap you're using and reduce your soap cost. The touch-less feature is also great when you are working with raw meats so you don't need to worry about cross-contamination. The company suggests filling the soap reservoir half way with warm water and than the rest with a liquid soap of your choice for the perfect foam. You can play around with your soap-to-water ratio to get the best foam and maximum cleaning power, while reducing your soap usage! It also has two soap dispensing settings, so you can control how much soap you are using at once. This needs four AAA batteries, which are not included. Promising review: "I totally love this soap dispenser! I have had it since Christmas (yes, this is the kind of thing nerds get for Christmas), and it has worked wonderfully. It saves so much soap but still gets all my dishes squeaky clean. It's great to not have to touch the dispenser when my hands are covered with dough or raw chicken grime. I am so happy with this product, and definitely would recommend it." —Alicia G.
Get it from Amazon for $33.95. 16. Leave your dishes out to dry on a silicone dish-drying mat rather than a fabric one to help avoid mold growth. This mat is made of 100% anti-microbial and anti-bacterial FDA food-grade silicone, which prevents the growth of germs, mold, and mildew. 17. Swap your sponge for a microfiber dish rag. Some reviewers say they clean better than a sponge. You can throw these guys in the washing machine to clean them! Get a pack of 5 from Amazon for $7.99 (also available in a 10 pack and 20 pack). 18. 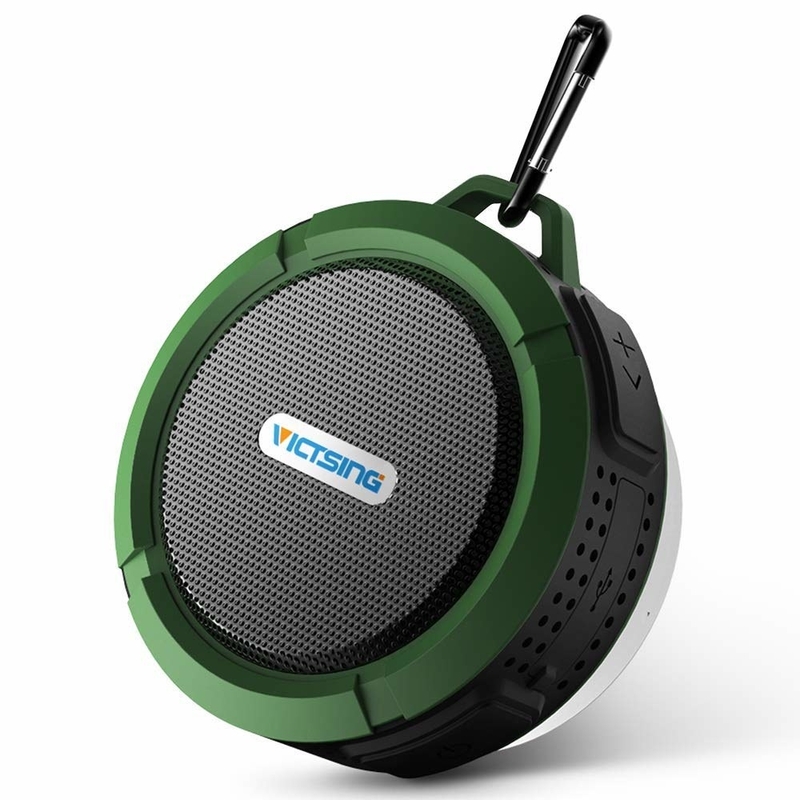 Listen to music through a water-proof bluetooth speaker to make your least favorite chore bearable while not getting electrocuted. Promising review: "This little thing kicks out some sound! It doesn't have that weird tinny sound that a lot of the cheaper models have. It hits a good range of highs and lows. We actually had to turn it down the first time we used it because we weren't expecting it to kick out sound like that. I often stick this onto my kitchen window so I can listen while cooking or doing dishes. Yesterday I walked up to the sink, and this speaker was sitting in a bowl full of water in the sink. I dried it off and let it sit for about 10 minutes. It works perfectly and you'd never know it sat in water for who knows how long." —Bill W.
19. 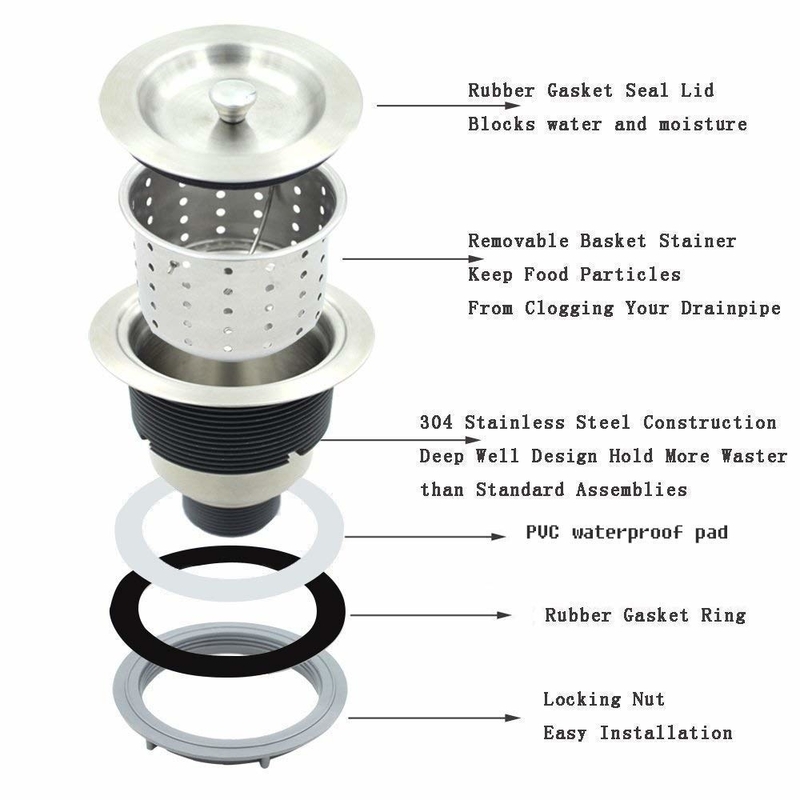 Keep your sink clean with a deep basket sink strainer. It attaches easily to your drain and will catch all the food debris to prevent your sink from getting clogged. The best part? 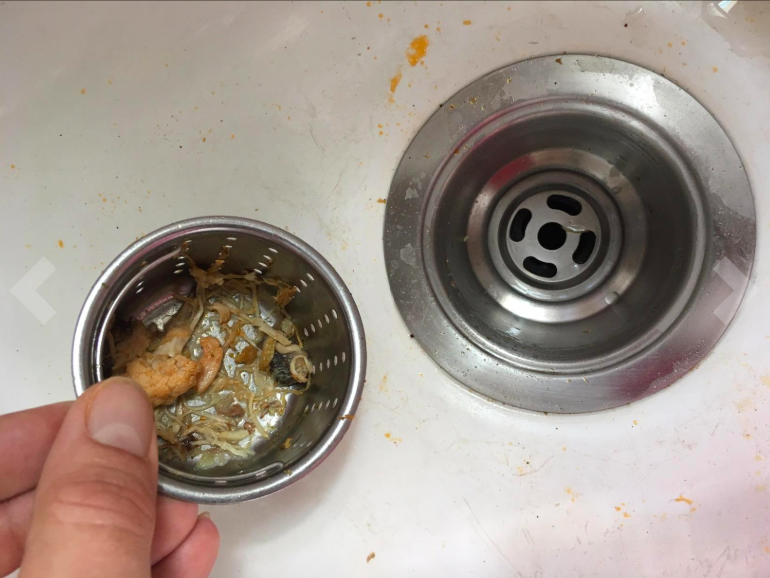 It adds depth to your drain, so it will catch more and save you from emptying it out multiple times during a dish washing. Get it from Amazoon for $12.95. 20. 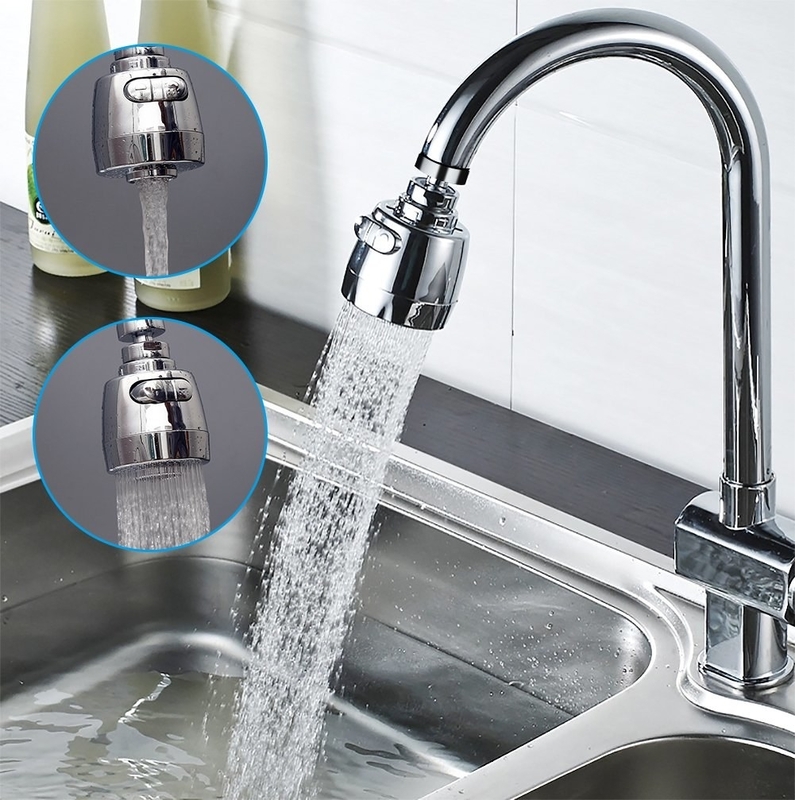 Attach a swivel tap aerator to your standard sink nozzle so you can use its 360-degree rotating powers to get in all those nooks and crannies. Short (pictured left): There are two spray modes and you can tilt the nozzle up to a 45 degree angle as well as rotate it 360 degrees. It has a "save mode" button that you can press, so if you are filling a pot or pan, it can save about 50% of water. Long (pictured right): This attachment also has two spray modes and you can rotate it 360 degrees. It acts more as a sprayer attachment than the short one. It has a "save mode" button that you can press, so if you are filling a pot or pan, it can save about 50% of water. 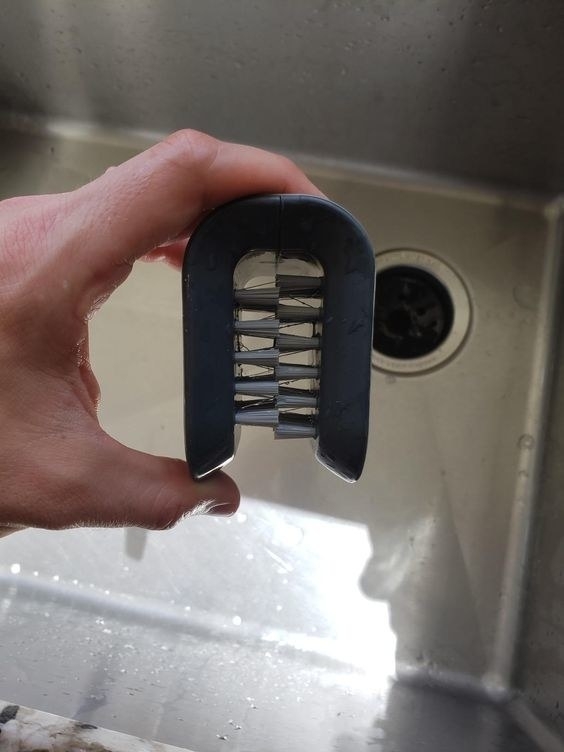 Promising review: "We don't have a dishwasher so I wanted a swivel tap that would make washing dishes easier. This is great. 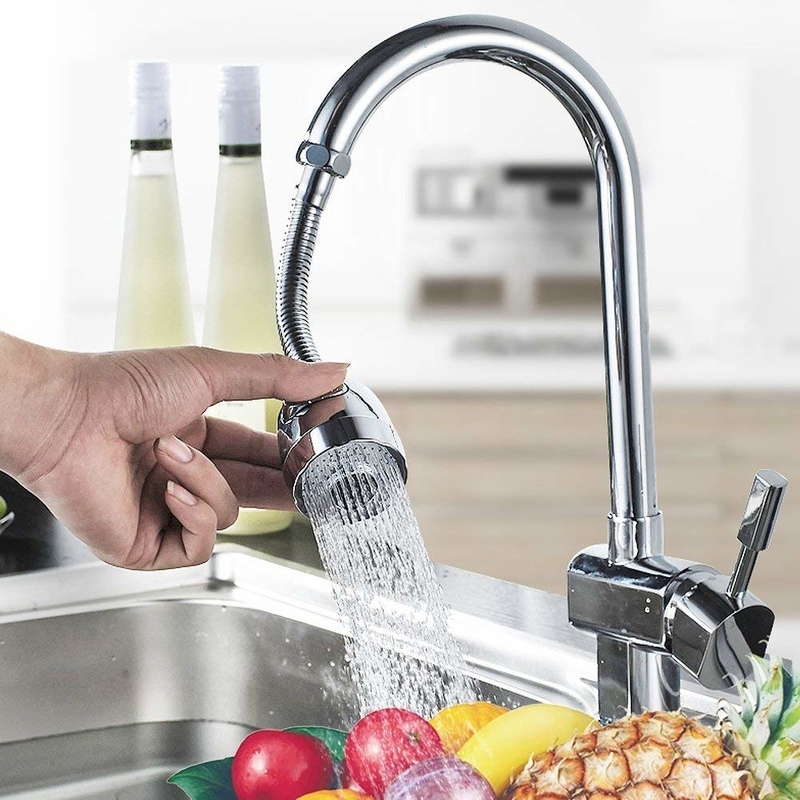 You don't have to pull on your faucet to switch between stream and spray modes. The buttons have small indicators on them to let you know which is which, and the spray mode gives you a nice large spray area." —Kelly R.
Get it from Amazon for $6.89+ (available in short and long). 21. Scour your dishes with the fan-favorite Scrub Daddy. It will change textures depending on the temperature of the water to ensure the best clean. Did I also mention it's smell and scratch resistant? You control your scrubbing power! The FlexTexture foam is firm in cold water for tough scrubbing and soft in warm water for light cleaning. And check out a BuzzFeed writer's in-depth Scrub Daddy review for even more info. Get a three pack from Amazon for $9.99. 22. 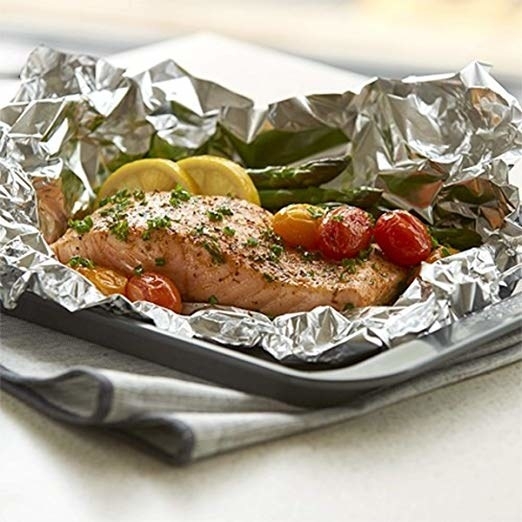 Cook with aluminum foil if you're in a rush, hosting a lot of people, or just darn lazy. Baking your famous lasagna in an aluminum foil tin or lining your pan with a sheet of tin foil before roasting veggies will save you from a lot of sink time. When you're done cooking with the tin, you can just toss it! Easy peasy, and no mess. When your done making your veggies, just toss them on a plate and throw out the tin foil. Your pan will look like it wasn't even used! Get a 25 pack of tins for $13.97 and a 130 square foot roll of aluminum foil for $10.59, both from Amazon. 23. Save yourself from hours of clean up by cooking your meals in a 6-in-1 Instant Pot. You can sauté chopped meat and then dump chili ingredients in for a delicious dinner, using just one pot/device. When you're done using it, just remove the pot from inside and rinse the lid. And check out a BuzzFeed writer's in-depth review on the Instant Pot. Get it from Amazon for $59.95+ (available in three quart, five quart, and eight quart). 24. 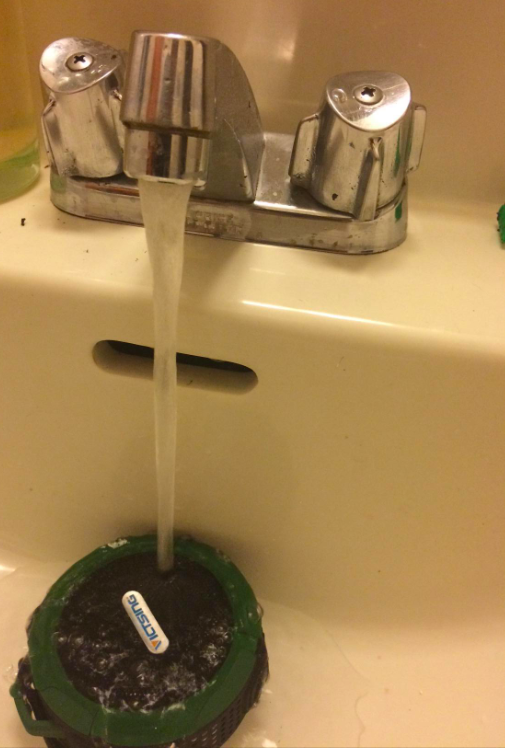 Unclog your sink using a sink plunger. It will fit perfectly over your kitchen sink drain and make it good as new the next time it gets backed up. 25. Prevent your clothes from getting drenched while washing dishes by using a splash paddy. When it's not in use, you can push it down until you need to use it again. It also adjusts to different heights for every member of the family or roommate in the house! Get a set of two from QVC for $15.89 (originally $17.50). 26. Hand-washing everything can be straight up exhausting, so take a *load* off by using a countertop dishwasher. Get it from Amazon for $223.97.